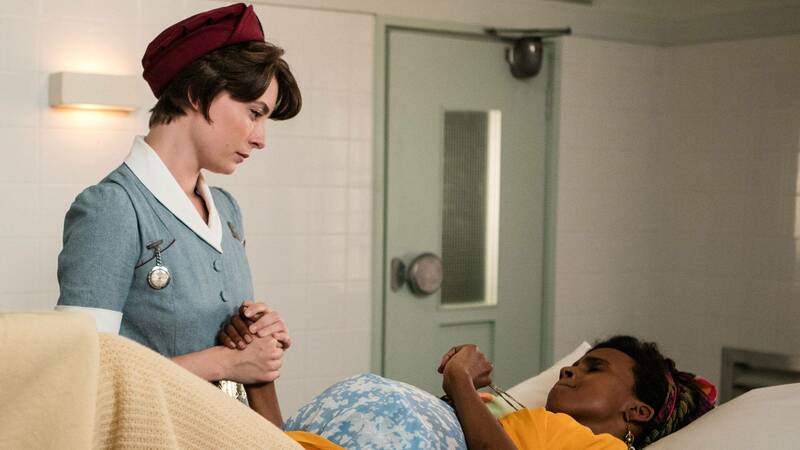 We’ve reached week six of Call the Midwife, and on top of Sister Mary Cynthia’s disappearance, Trixie’s possible dentist beau, Patsy’s world travels, and a new midwife, there’s a whole Cuban missile crisis that’s caught Poplar — along with the rest of the world — in a state of panic. As our Our Nonnatus House residents worry about the United Kingdom’s fate as nuclear missiles in Cuba put everyone in danger, they still must put on a brave face as they deal with emergencies at home. While Sister Mary Cynthia remains at The Linchmere, Sister Monica Joan is in a constant state of distress as she worries about the wellbeing of her friend. Visiting every day, she prays for Sister Mary Cynthia from beyond the ominous black gates of the hospital (because of course this most sinister place has black gates) until Fred retrieves her and brings her back to Nonnatus House. Refusing cake and tea, her favorite morning, midday and evening snack, Sister Monica Joan won't eat anything until Sister Mary Cynthia is no longer in suffering at the asylum. Stand strong, Sister! As strained U.S.-Soviet Union relations continue, Britain’s citizens, along with our midwives, watch from the sidelines as the events of the Cuban missile crisis unfold. At the house, Fred insists on tuning in to President Kennedy’s speech, which threatens to retaliate against the Soviet Union should it launch a nuclear missile toward any Western ally. Don’t the midwives have enough problems? Trixie thinks so, and refuses to be burdened with the negative news. At The Linchmere, Sister Mary Cynthia is slowly making progress. A nurse informs her that she has been transferred to a general ward, which is a bit of an abrupt change but also relieving since she has lived in solitude for her entire stay at the hospital. Though she is still taken aback by the new and unexpected transition to this environment, her move signals the possibility of release to the Nonnatans. After a seemingly successful first date with Trixie, a handsome Christopher Dockerill is now trapped before the ever-inquisitive Sister Monica Joan, who is skeptical of his intentions (because nobody likes dentists, remember?). Luckily, he’s saved from a game of "20 Questions" after Nurse Crane stumbles upon the pair deep in conversation and invites him inside while Trixie is on call. Despite making it past the door by impressing at least one Nonnatan, Trixie ignores his advances. Better luck next time, Christopher. Thus far, Valerie has had a seamless transition into the house (good move bringing cookies on the first day) — but it doesn’t last long. This week she encounters Mrs. Farah, a patient whose cultural background comes into play as the episode explores the practice of female genital mutilation. After Mrs. Farah has her first appointment, the midwives discover that the procedure, which Dr. Turner claims is a “practice common in parts of Africa and the Middle East,” has been performed on her much to the shock of the midwives. The situation physically complicates Valerie’s next steps in delivering Mrs. Farah’s baby, but it also creates an internal conflict as Valerie questions how to both support the expectant mother but also voice her opinion against FGM. As Valerie trudges through this learning experience with Mrs. Farah, Sister Winifred steps up for a more lighthearted lesson of her own. Sister Winifred has had such success getting the word out about brushing teeth, that she decides employing one of these newfangled “automobiles” in lieu of her bike to truck her materials around Poplar. After Nurse Crane agrees to give driving lessons, Sister Winifred takes every opportunity to practice as she can. Sitting on a stationary chair while steering a pillow might not be the best way to learn, but we’ll let this one go. She’s back! After a long and draining stay at The Linchmere, our beloved Sister Mary Cynthia is discharged from the hospital and returns to Nonnatus House. Though her journey has been emotional, Sister Mary Cynthia seems to have a refreshed outlook on life as she arrives home. Later, Valerie’s dilemma comes to a head. Calling on Mrs. Farah for a routine checkup, Valerie soon discovers that the expectant mother has been in labor long before her arrival and was hiding it from everyone. Though Mrs. Farah’s doctor said she should call the hospital the minute she felt contractions, the mother-to-be was too frightened to go through with it. Now we’re out of time, and Valerie must gain her trust to deliver Mrs. Farah’s child in an ambulance — knowing full well that they won’t make it to a doctor in time. With trauma from her experience with FGM, Mrs. Farah tries to resist delivery, but Valerie finally wins her trust with the promise that she won’t use a knife. From an ambulance to the streets of Poplar, pandemonium ensues as the rest of the midwives turn their attention to the latest news of the Cuban missile crisis. Though Britain plays a minor role, being a mere ally to the U.S. places them between the warring countries and nuclear weapons. While some of the midwives, like Barbara, choose humor to soften the blow, Trixie decides to make the most of her life and what little time she might have left. Despite her earlier attempts to avoid Christopher, Trixie takes him up on his offer for a second date now that the fate of their country is unknown. The two learn that war has affected them both when Christopher reveals that he fought in Korea and Trixie explains her father had difficulty coping with what he saw during battle. Eventually moving past the dark subject, Trixie realizes that she quite enjoys being in Christopher’s company and even allows a little K-I-S-S-I-N-G. Finally some good news for all our Nonnatans: The world doesn’t end! As we obviously know, but our midwives are understandably overjoyed to find out, the Soviet Union agrees to remove their missiles from Cuba, and the crisis between the two countries, though still hostile, comes down to a simmer. Trixie admits to her comrades that she kissed Christopher on their end-of-the-world-date, but it’s clear that nuclear war or not, she’s pretty smitten with the dentist. While most of the midwives are able to celebrate the not-end-of-world, Sister Mary Cynthia, despite her happy return to Nonnatus House, has a minor anxiety attack during the height of the missile crisis and recognizes that she still needs some sort of treatment. And after everything — the assault, the PTSD, and shock-therapy, she decides on a place with a bit more quiet. And just like that, the welcoming community of Northfield welcomes a former nun trying to reclaim a sense of self, resuming her life simply as Cynthia. Stream Episode 6 now and don’t forget to catch Episode 7 next Sunday at 8/7c. Read more GIF recaps here. Sister Mary Cynthia, formerly Nurse Cynthia, has been at Nonnatus House for many years.